Mike Trout was due to become a free agent after the 2020 season. CLEARWATER, Fla. — Mike Trout will still have his seats in the south end zone at Lincoln Financial Field and his green Eagles hoodie and knit hat. He can still go hunting with pal Carson Wentz. And he will still live in a house not far from his parents in his hometown of Millville, N.J. But play for the Phillies? That isn't happening. 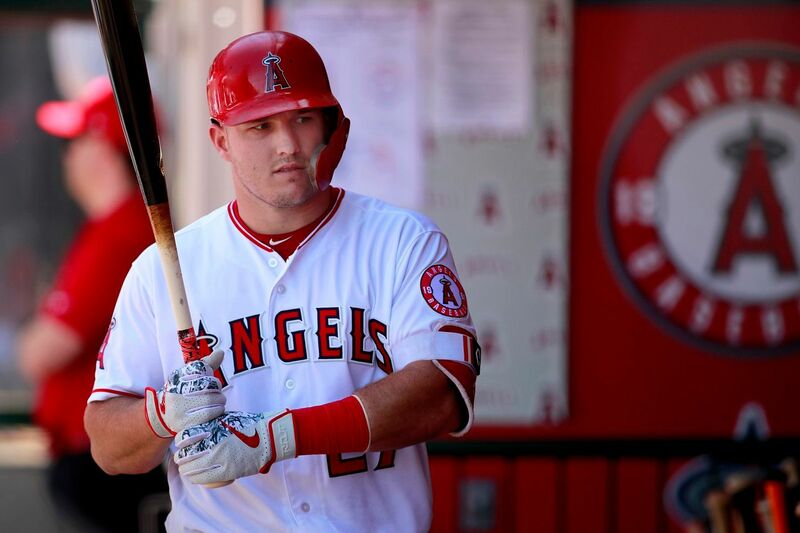 Trout is on the verge of finalizing a 12-year, $430 million contract with the Los Angeles Angels. The agreement, confirmed by two league sources, will take Trout through his 39th birthday in 2030 and end years of wishful thinking by Phillies fans that the best baseball player in the world would come home to play if he became eligible for free agency after the 2020 season. If the news sent shock waves through the game, it was only because of the size and scope of a contract that will become the largest in American sports history. Trout is due to receive $100 million more than Bryce Harper, who signed a 13-year, $330 million contract with the Phillies on March 2 and pledged a few days later, at the risk of tampering, to lobby Trout to team up with him in two years. But officials from multiple teams said Tuesday that they never believed Trout was going anywhere. If the Angels had allowed the 27-year-old centerfielder to walk as a free agent or traded him before he reached the open market, it would’ve been akin to the Red Sox selling Babe Ruth to the Yankees in 1919. One executive invoked a more modern comparison: the Edmonton Oilers’ trade of Wayne Gretzky to the Los Angeles Kings in 1988. Just as most industry insiders believed that Phillies owner John Middleton wasn't going to be outbid this winter for either Harper or fellow free-agent star Manny Machado, it "seemed inevitable," in the words of another team executive, that Angels owner Arte Moreno would find a way to keep Trout. Folks who know Moreno insist that he had no interest in joining ex-Red Sox owner Harry Frazee and Oilers owner Peter Pocklington in the ignominy of letting an all-time great flee to another team. He was so bent, in fact, about Trout staying in Anaheim that Angels officials would all but hang up the phone on any team that called to inquire about trading for him, according to a rival executive. But Trout had to want to remain with the Angels, too. The presumption, at least among Phillies fans, was that he would prefer to come home. He lives in Millville in the offseason, they said, and his wife is from South Jersey, too. It didn't escape their notice that he has flown across the country on Mondays off in September to attend Eagles games at the Linc. And can Trout even get a good cheesesteak in Orange County? Mike Trout greets Zach Ertz before an Eagles preseason game. By all accounts, though, Trout is comfortable in the shadow of Los Angeles. He's low maintenance and even lower key. When commissioner Rob Manfred said at the All-Star Game last summer that he wishes Trout would be more open to marketing opportunities, Trout countered that he's content to just play baseball. Doesn’t exactly sound like a superstar who craves the attention that would come with playing in his hometown, especially one that is as passionate about sports as Philadelphia. Trout’s ego has never required that kind of puffing. He can still walk around southern California wearing his white No. 25 Ben Simmons jersey. He can still be an Eagles superfan, all without the pressure and expectation that would come from actually playing across the street. The only question, then, was whether Trout would be willing to stay with an organization that hasn’t won a playoff game since he made his major-league debut in 2011. The Angels haven’t reached the postseason since 2014 and haven’t had a winning season since 2015. Locking up one player for nearly $36 million per season won't make it any easier for them to build a winner. But the Angels did sign Japanese sensation Shohei Ohtani before last season. They have a top-notch farm system and a $3 billion local television deal that figures to leave them flush with cash to make future big-ticket buys. And the Phillies? They can feel even better about striking to sign Harper. Future free-agent classes have a way of thinning out before they materialize, and between Trout and third baseman Nolan Arenado’s eight-year, $260 million extension with the Rockies, the next two got considerably weaker. Nationals third baseman Anthony Rendon, eligible for free agency after this season, could be next to sign an extension. All eyes are on Red Sox star Mookie Betts to see if he will avoid going on the market in two years. With Harper on board, it’s easier for the Phillies to give up the ghost, if they ever actually chased it in the first place, of someday pairing him with Trout and get on with the business of trying to return to the playoffs at the end of their 3½-year rebuild. And if the Eagles happen to be playing at the same time, Trout can always drop by and say hello.